How to Run GlassFish on Ubuntu 16.04 LTS? 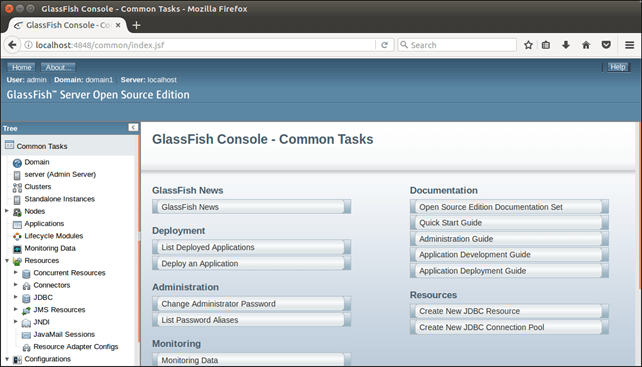 GlassFish is a lightweight, modular web server. It can be used for the development of J2EE applications and Java Web Services. It provides awesome performance, scalability and reliability. In this tutorial, we are installing Glassfish that includes the following steps. 1) Download Archive from the Oracle official site https://www.oracle.com/index.html. where archive-name.zip is our downloaded glassfish name. Move the Glassfish server to the /opt/ directory by using the following command. Although we can move it to any place and run. This directory is used to install third party software applications. First, change current working directory by using the following command. Glassfish has started, we can access it on the browser using localhost:4848, because it runs on 4848 port by default. On the browser, its output looks something like the below. Well, we have setup GlassFish successfully. Now, we can perform server related tasks. Mange server by using following commands. Execute all commands after changing directory to /opt/ glassfish5/bin/ directory. Use the following command to start Glassfish server. Use the following command to Stop Glassfish server. Use the following command to Restart Glassfish server. Use the following command to deploy application on Glassfish server. Use the following command to undeploy Glassfish server.